Service Costs > How Much Does It Cost to Rent a Photo Booth? Photo booths are portable booths with a built-in camera connected to a computer and a printer, and the photos are printed a few minutes after the picture is taken. These photo booths can often be found in malls, theme parks, or restaurants, and these types of photo booths can charge by the photo, or if you were to rent one, it would depend on a few factors. The cost of a photo booth will depend on the number of hours needed, the type of photo booth, add-ons, geographical location and company offering the booth. On average, renting a photo booth can range anywhere from $600 to $1,300 for two to four hours, with additional hours costing upwards of $100 per hour. According to our research, we had found most people, commonly brides, paid about $1,000 to $1,200 for four hours with unlimited photos. Most companies that rent a photo booth will have packages available and won’t charge by the hour. The Mad Mochi Photo Booth company, for instance, lists their prices on their website. Depending on the package you choose, it can range anywhere from as little as $549 for a photo studio for two hours to as much as $899 for the classic enclosed photo booth for up to four hours. According to a few members on WeddingWire, they paid anywhere from $1,200 for four to six hours with some extras to $1,000 for unlimited pictures for four hours. Phhhoto booth, a social photo booth that can create animated GIFs for your party, takes a different approach when compared to the traditional booths. The price, however, is much higher. According to the company, the pricing starts at $5,000 and this will include the setup, custom watermark, web gallery, sharing to social media, attendance and tear down. There are two common types of photo booths available: an enclosed photo booth, similar to the one you would see at a mall or theme park, or an open-air booth that requires a tripod and a white backdrop. This type of setup would often include props and an assistant to help take the pictures as people enter the staging area. The booths, if self serve, are relatively easy to operate: Simply enter with the props, press a button and the photo, usually a 4×6 or 2×6, will be ready in less than a minute on average. From most of the packages we saw online, it often includes free delivery within 25 miles, unlimited photos for up to a certain time period, setup/breakdown, an on-site attendant and liability insurance. These packages will require a two to four+ hour commitment. The photos taken in the photo booth will often be saved on a storage device, and some companies sometimes offer a scrapbook where all of the photos taken during the event will be printed for an additional price, while others may include the scrapbook with the estimates mentioned above. A photo guest album, if requested, could cost an additional $50 to $100. The same could be said for those who want a DVD. Personalized photo strips from the event can cost another $30 to $60. Custom backdrops, outside of what the company offers, can be an additional $100 to $350, depending on what you’re looking for. The same can be said about props. If you were to need more or larger props, this could be an additional cost to consider. A custom guestbook station, where guests can decorate and create their own book, can cost an additional $50 to $100 for the supplies and setup. Some high tech companies often allow you to share these photos instantly on social media live for a small fee, usually $50 to $150. A travel fee may apply if the company has to travel outside of their radius, usually 25 to 50 miles or more. If outside of the radius, this can be an additional $3 per mile traveled. Packages are often allotted for a certain amount of time. If you were to go over this time limit, then an hourly charge can apply, usually around $100 to $200 per hour. Most companies charge by the hour regardless of the number of pictures that will be taken. You will be able to take as many pictures as you want as long as the shots were taken within the specified time. The best way to save money is to compare rates between at least three companies. While most companies offer their pricing on their website, some may require you call to obtain a quote. 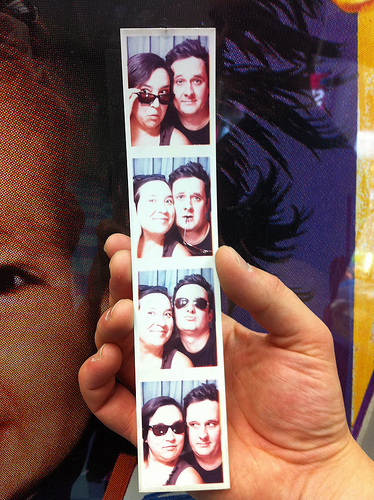 As you can see, renting a photo booth can be quite expensive. To save money, consider creating your own DIY photo booth as seen here. Some people have had luck searching Groupon for local photo booth rental deals. Saturdays will always be the most expensive day of the week. If you can, try rent on a Friday or another day of the week. Doing so can help you save 20 percent or more. Schools, non-profits and some government organizations are often entitled to discounts, so it doesn’t hurt to ask. I’d say the photobooth prices are so over rated, I do have my own photo booth and we charge $250 for 2 hours,that includes personalized backdrop, digital album, scrapbook album, 3 prints per session, and with all those included our profit is still high.